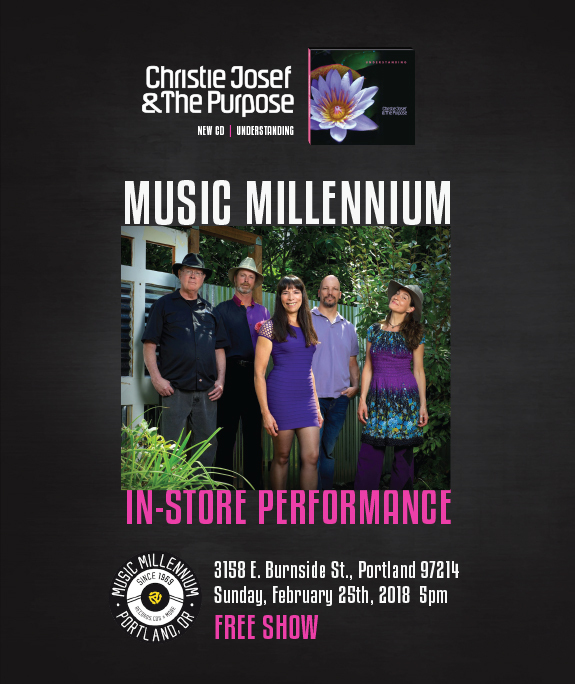 Join Christie Josef & The Purpose for a free in-store performance at Music Millennium on Sunday, February 25th at 5pm. "Over 40 years later and Music Millennium is the oldest record store in existence in the Pacific Northwest. As people who know and love music, Music Millennium has hosted an array of in-store performances and autograph appearances over the years, including the likes of Richard Thompson, Luscious Jackson, Loreena McKennitt, Maureen McCormick (aka "Marcia Brady"), Blue Rodeo, Shonen Knife, Matthew Sweet, Soundgarden, Mike Watt, Don Walser, Sheryl Crow, Randy Newman, Everclear, Jewel, Little Feat, Susannah Hoffs and Cheap Trick to name a few." Come and hang out at this venerable record store supporting music and musicians for over 40 years and listen to a special crafted set list off of our new CD (available for purchase) as well as a few older favorite tunes.